ChemValve is committed to bringing its customers all the special design options it needs to handle their flow material. We can assist you in choosing the options you need or custom design features as well. PREP FOR CHLORINE: ChemValve can prepare a valve for chlorine service which will include B7 fasteners instead of 316 SS and the notching of the “Upstream” seat. •DRILLING AND TAPPING: This is to prepare the valve for actuation. •TAGGING: ChemValve will also Tag your valve in a variety of material. 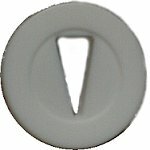 A paper tag is standard, however, we can Tag the valve with an aluminum tag or 304 SS tag. Both the Aluminum and SS tags are 0.005” thick by ½” wide with SS wire to the valve. PLUG LINERS: ChemValve can offer our customers a different liner material on the plug than lined in the body. For example, we can make a GRPFA plug for any standard lined valve. • EPOXY MASTIC PAINT OR SPECIAL PAINT COLOR: ChemValve will paint the exterior of our valves with epoxy paint in whatever color you need. Our standard valve color is a dark maroon. • LOCKING HANDLE FEATURE: We offer both the lock open and lock closed handle. • NOTCHING OF SEATS: ChemValve can notch the seats in the “Upstream” or “Downstream” state. BALL BEARING GEAR OPERATORS: We can provide for all our valve sizes. EXTENDED FACE TO FACE: This is a ChemValve special design to meet face to face dimensions for any valve that is longer than our standard face to face. This is a reliable answer to diaphragm as well as other longer patterned bodied valve replacements. These valves are as repairable as a diaphragm valve, just more reliable! 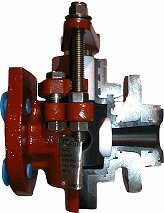 Special grooved and molded rings allow face to face of standard valve to be extended to replace a variety of longer pattern valves with no break in the liner. Once bolted into the piping, the molded in parts will be given additional support by both upstream and downstream pipe flanges. CHAIN WHEEL OPERATOR: ChemValve can provide a “bolt-on” type of operator for the model 790EB-150 and 790EB-300. ChemValvecan also provide the needed chain. • SPECIAL “RYTON” COATING: This is a high temperature coating on the metal parts of the valve for corrosion protection. This application can be applied to the model 790EB-150 and the 790EB-300. •SPECIAL MATERIALS FOR FASTENERS: ChemValve can offer the customer a variety of different bolts, nuts, and all-thread studs. ChemValve offers a variety of seat options in both standard and characterized forms to meet our customer’s flow problems. We can customize your valve with the seats you need to solve the problems you’re having with the flow material. Since ChemValve seats take the wear of the plug, the body and bonnet liners last longer against the effects of corrosion, pressure and temperature. The replaceable seats in the Model 790EB give lower operating torques equating to additional benefits including ease of turning and downsizing of actuators. 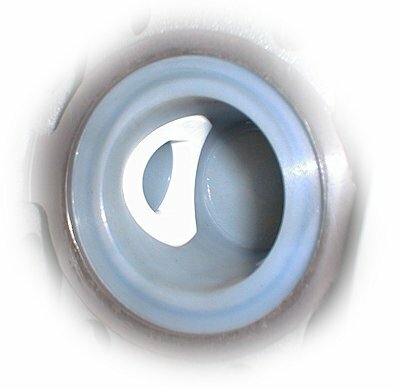 All ChemValve seats and plugs are easily replaced without removing the valve from the pipe line. The replaceable seats contribute directly to long term cost savings. ChemValve is committed to bringing its customers all the special design options it needs to handle their flow material. We can assist you in choosing the options you need or custom designing features as well. • PREPARE VALVES FOR CHLORINE SERVICE: This option will include B7 fasteners instead of alloy steel fasteners. • TAGGING: ChemValve will also Tag your valve in a variety of material. A paper tag is standard, however, we can Tag the valve with an aluminum tag or 304 SS tag. Both the Aluminum and SS tags are 0.005” thick by ½” wide with SS wire to the valve. • EPOXY MASTIC PAINT OR SPECIAL PAINT COLOR: ChemValve will paint the exterior of the valve with DuPont 25P epoxy mastic paint in any color available for our customers. Our standard paint color is a dark maroon. • SOLID PVDF (KYNAR) BALL: This is instead of a solid PTFE ball in our PVDF lined valve. This is a ChemValve special design to meet face to face dimensions for any valve that is longer than our standard face to face. This is a reliable answer to diaphragm as well as other longer patterned bodied valve replacements. These valves are as repairable as a diaphragm valve, just more reliable! Special grooved and molded rings allow face to face of standard valve to be extended to replace a variety of longer pattern valves with no break in the liner. 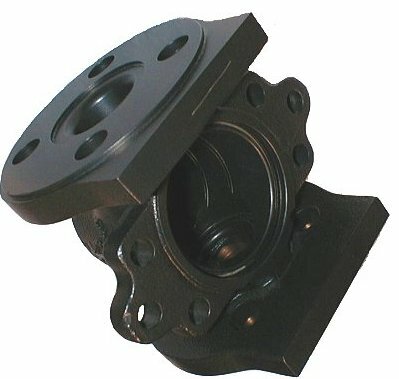 Once bolted into the piping, the molded in parts will be given additional support by both upstream and downstream pipe flanges. • “O” RING SEAT-KALREZ OR CHEMREZ “O” RING MATERIAL: This option is available to help our customers who need a tight shut-off in their system. •ChemValve offers a variety of spring material such as Hastelloy B2 and Titanium. • PFA ENCAPSULATION OF SPRING: This option is available for all our spring material or “high rate” springs. • SPECIAL “HIGH RATE” SPRING: ChemValve can vary the PSI on all our springs.